Romney isn't really attacking Big Bird. He's making a point about his view on the role of government. When proponents of small government attack public funding of arts + culture, they do so understanding that they are tapping into a widely held default belief that arts + culture are a private matter and a low priority, especially among public priorities. Until we do the work of changing this common way of thinking about the arts -- they will continue to be subject to this sort of political rhetoric. 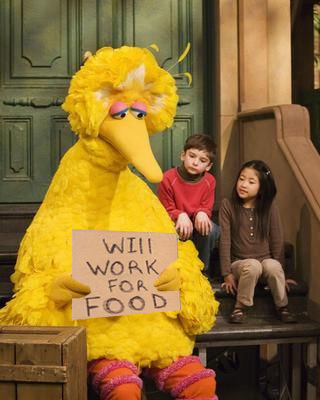 And sadly, engaging in a fight about how worthy Big Bird (or PBS) is of public funding will be a waste of our energy. When we start swapping facts about how valuable publicly funded cultural programming is to our nation, we're fighting on a playing field where we don't compete well. In other words, we're stuck in the frame of our detractors. Check out the comments on this Facebook posting as an example. It's very hard for people to see the arts as equal to other public services when they are thinking of the arts as just individual expressions and performances to be consumed. Facts don't help us when people are already comparing hungry children or increased taxes to a show people can choose to watch, a painting on a museum wall, and so on. Of course, we know arts + culture do better with broad public support. But for that to happen people have to see the arts as a public good. Topos research on how to communicate about arts + culture to build broad support provides much more to consider about this reality. And this report has the tools to start a new conversation -- built on OTHER widely held beliefs -- about how the arts change places, bringing people together and creating streets and neighborhoods where we all want to be. Over time, we can change the default way of thinking about the role of arts in community. Until we do, we can expect that the National Endowments and public funding for cultural programming of all kinds will often be first mentioned when political people want to suggest that we can make government smaller. Topos research on how to communicate about the arts is important if we are going to move ahead in the discussion of what the arts do for our community. We all need to get in there and change the conversation.